Lock in a great price for Chalston Beach Resort – rated 8.4 by recent guests! the restaurant staff was exceptional! Beautiful grounds! The staff are nice, the location is great and I recommend the hotel as the best in area for tourists. Beautiful resort with a perfect location! The resort is beautiful and well maintained, and the restaurant overlooks the beach-front. The staff is helpful and looks after all your needs. Perfect place to spend a relaxing holiday! Relaxed check-in and -out process; very well maintained, beautiful gardens; spotless clean, fresh linens and towels every day; very calm resort despite the bustle of this area. Thumps up for the excellent location. Bang on the beach front, with semi private beach access. The hotel has a well maintained beautiful big garden. The staff were very cordial. Cleanliness also up to the mark. Good value for money. Ideal place for family vacation. We were given a bigger room than expected..Restaurant is fabulous. Staff is good. Owners live next to the property, so everything is well managed..
Chalston Beach Resort This rating is a reflection of how the property compares to the industry standard when it comes to price, facilities and services available. It's based on a self-evaluation by the property. Use this rating to help choose your stay! One of our top picks in Calangute.Featuring an outdoor swimming pool, the beachfront Chalston Beach Resort is on beautiful Calangute Beach. Free Wi-Fi access is available in the public areas of this resort. The elegant air-conditioned accommodations include cable TV and a sitting area. There is also a refrigerator. Featuring a shower, private bathrooms also provide towels. At Chalston Beach Resort there is a 24-hour front desk, a garden and a bar. Other facilities available at the property include a tour desk and a laundry area. An array of activities can be enjoyed on site or in the area, including billiards and ping-pong. The property provides free parking. If you feel like exploring the area, check out Baga Beach, a 2-minute walk away. Mapusa Bus Station is 6 miles away and Thivim Train Station is 19 miles away. This resort is 28 miles from Goa International Airport. The property houses a restaurant that serves Indian, Chinese, Italian and local specialties. Private dining is available with room service. 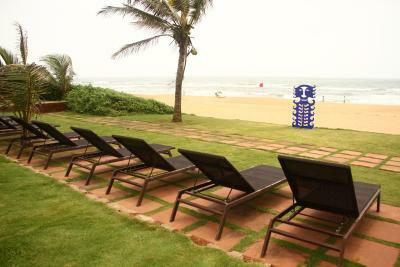 This is our guests' favorite part of Calangute, according to independent reviews. 뀐 Located in the top-rated area in Calangute, this property has an excellent location score of 9.2! When would you like to stay at Chalston Beach Resort? The elegant air-conditioned accommodations include cable TV, a balcony and a sitting area. There is also a refrigerator. Featuring a shower, private bathrooms also provide towels. The elegant air-conditioned accommodations includes cable TV,balcony and sitting area. There is also a refrigerator. Featuring a shower, the private bathrooms also include towels. This chalet has a balcony, air conditioning and mini-bar. Family run property ( 3 generations currently) , one of the few in Calangute with vast gardens, right on the beach. House Rules Chalston Beach Resort takes special requests – add in the next step! Chalston Beach Resort accepts these cards and reserves the right to temporarily hold an amount prior to arrival. The extra bed charges from August - December 21st for children between 6 - 12 years are INR 750. For an extra adult the charges will be INR 1500. The extra bed charges from December 22nd - January 2nd for children between 6 - 12 years are INR 1500. For an extra adult the charges will be INR 2500. Please note that the Standard Double Room cannot accommodate extra bed/person/child. Additional room charges must be paid at the time of check-in. The bathrooms are little small (In goa you don't spend a lot of time there ). The Foos ball table wasn't functional. Maintainance and housekeeping could have been better. Location,and the overall environment of the resort.. Right on the beach. And our room was large, airy and clean. The location is good !!!! 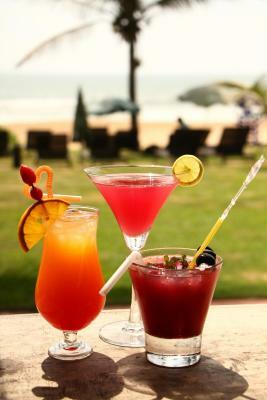 Beachside view nd ambience is also very good specially during sunset !!! On the whole a perfect getaway for anything !!!! The breakfast spread was more than adequate. It was an optimal mix of Indian and continental cuisines. The spread also included a healthy fruit platter. With the breakfast being complementary and the timing for the breakfast being between 7:30 - 10:30, I would say it made up for a great way to start the day. The staff at the resort is extremely courteous and cooperative. They do have a sharp eye for the guest's comfort and almost all of them were ready to go the extra mile. The location of the resort could not have been better.It is literally on the beach.Nestled comfortably between Calangute and Baga, two popular beaches in north Goa, the resort can actually boast of a private beach. Could not get internet in the room, but it was nice to disconnect for a couple days. On two occasions saw staff hitting or kicking the dogs in the face! Beautiful Labrador retrievers just let the staff abuse them, I wanted to beat the staff!! Chalston has always been great...my fourth stay at the property...great service, friendly staff and very well maintained landscaping...will continue to come here. The staff were quick to help whenever it was required. I came with parents ( senior citizens), our room was far enough (200mts) from restaurant and the beach. Also the rooms are aging and not maintained at par with its tariff. Hotel should do something to fight mosquito and geckos.